After a weekend of wondering whether the tornado was going to take me away, or if I was going to lose my power, or if the rain was just going to wash us all away, and not really eating anything that constitutes ‘real food’ in anyone’s book (baked veggie sticks, cookie dough, tortilla chips… although there may have been a few fruits & veggies in there) I wanted something real. Something comforting & delicious (obviously! ), but I wanted to eat an actual meal. Thankfully, I hadn’t lost power, so I didn’t have to throw anything out – I went looking in my freezer & fridge, and found some chicken drumsticks and some potatoes. I then raided my cupboards and found some canned green beans that were ‘best by’ last Monday. I double-checked online to make sure they were safe to eat, and voilà! 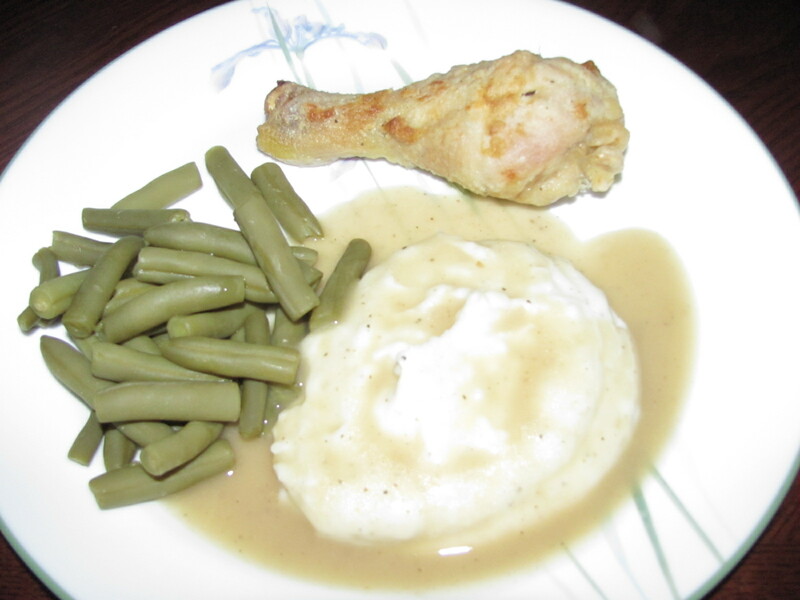 I had my homemade, comforting, delicious ‘real’ meal – oven-fried chicken, mashed potatoes, and green beans. Total American comfort food. As I was getting the chicken ready, I remembered that a while back I had roasted a whole chicken, and saved every last bit of that bird that I could. 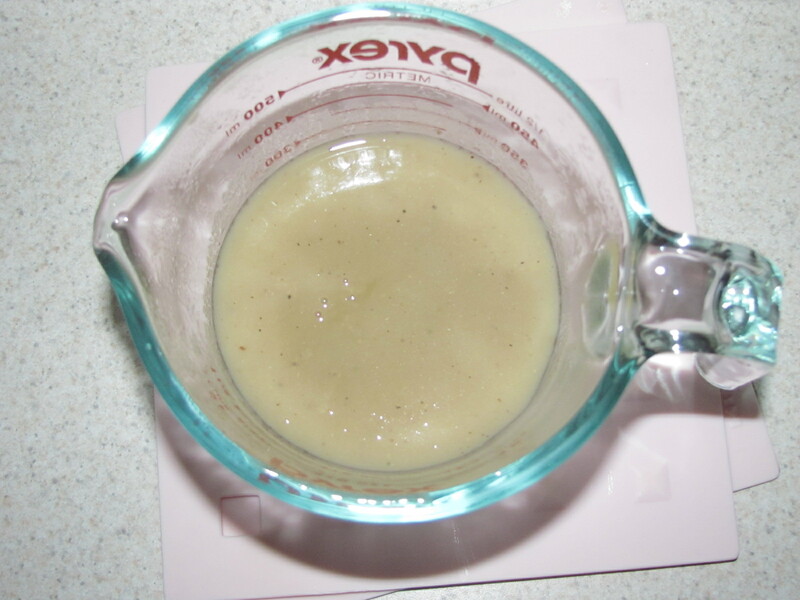 I’d already made stock from the bones, but I still had a whole container full of the drippings – which meant I could make gravy to go with my mashed potatoes!! Sweet! I’ve really only ever made gravy when I make shepherd’s pie (and I think I may have attempted it for the 2 times I’ve ever made roast beef) but I know the general idea. So after getting the chicken, potatoes & green beans underway, I threw 2 tablespoons of the chicken drippings and 2 tablespoons of flour in a pan, let that warm up and mix up so I had a nice roux, then added 3/4 of a cup of water from the potatoes (right before I drained them) and 1 1/4 cups of chicken stock. 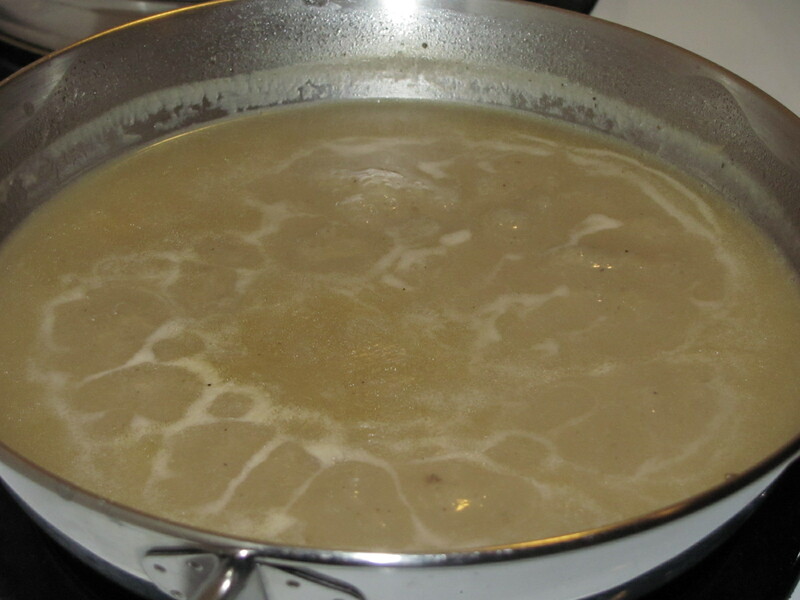 Then I let that cook ’til it thickened, seasoning it with salt & pepper, and then (for any Bridget Jones fans) – I sieved it, but not because it was lumpy… Since I had used the chicken drippings, there were bits of chicken in the gravy that I didn’t really want. I didn’t use any kind of recipe for the chicken or potatoes – never have. I think this meal was probably one of the first meals I ever cooked back in high school – my mom was getting her master’s degree, so she’d leave me directions for dinner when she had class. I dredged the chicken pieces in a mixture of flour, salt, pepper, and garlic powder, and added a little bit of olive oil drizzled on the bottom of the pan and over the chicken, then cooked it at 375° until it got golden brown (although I do have a thermometer that I probably should have used…). As for the potatoes, I like mine with salt, pepper, butter, milk, and cream cheese (or sour cream). Soo good!!! the end result - yum! !